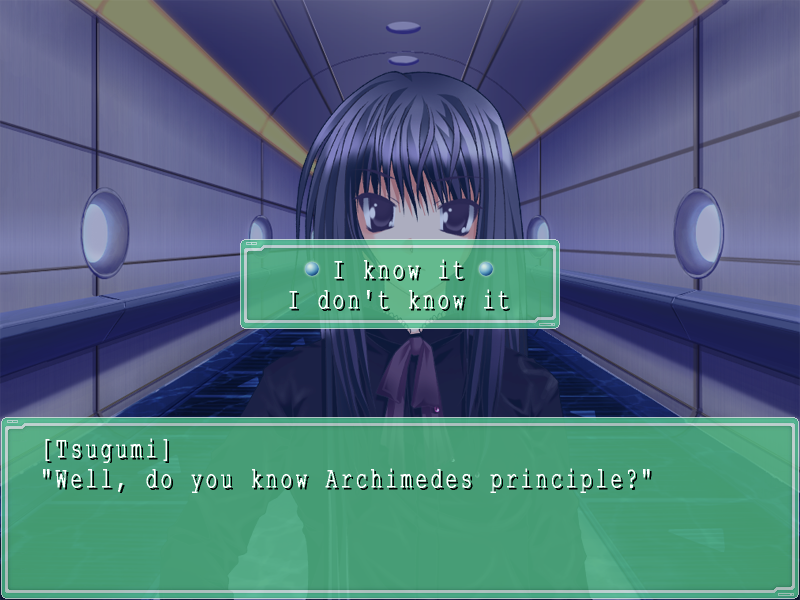 "Of course I know about that. The buoyancy of a submerged object is equal to the weight of the liquid displaced by the object. And what does that have to do with what we're talking about?" "How about you figure the rest out yourself?" Well, at least he recognizes what shes doing. I gave a deep sigh and shook my head. After walking a while, Tsugumi turned right ahead of me. I followed after her. Turning the corner it finally hit me. "I see.... So that's what you meant... I thought it was weird you inviting me along." "To sink that egg elevator to the third floor its total weight had to be greater than the force of the buoyancy. So just one skinny girl like you wasn't going to be enough weight." "Right. So don't get me wrong. Of the five people trapped here, you're the heaviest, weight-wise, right?" "Y-you...I'm not just some big rock paperweight!" "No. You're more than a rock... You're a rock head." Yellow and black stripes appeared dimly ahead. "This it? 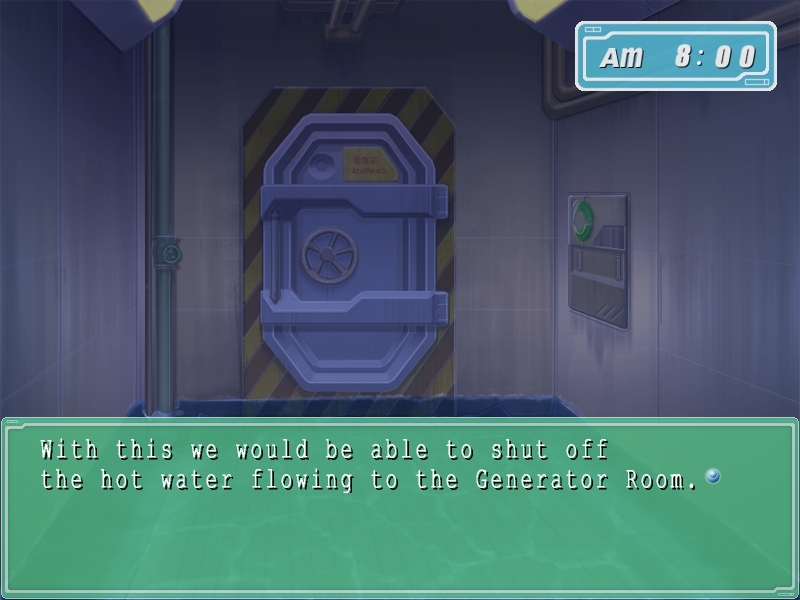 This the Generator Room...?" There was a plate with information in front of the door, but it was too dark to read. "If you don't talk, I don't understand." Tsugumi held my arm firmly. The wet palm of her hand felt cool. I didn't know what she wanted to say. I tried to read something from her expression, but it was too dark to see. "I don't think you should open it..."
Tsugumi nodded and gently removed her hand from my arm. And then she quietly approached the door. She tossed some of the water droplets from her hand at the steel door. The droplets sizzled on the door, evaporating away. "Is there a fire or something inside?" "The generator uses hot water, so I don't think it could be a fire." "It's probably steam... I think it's just packed full of extremely hot steam." "This generator is designed to operate normally at 6 atmospheres. But right now LeMU's air pressure is at 1 atmosphere. There is a possibility that a tank or pipe filled with high-pressure steam could have ruptured. Or that some abnormality was detected and triggered a safety valve to be opened..."
"Oh, I get it. Either way, steam is leaking from somewhere and there isn't enough power to turn the turbine... And so the generator stopped. 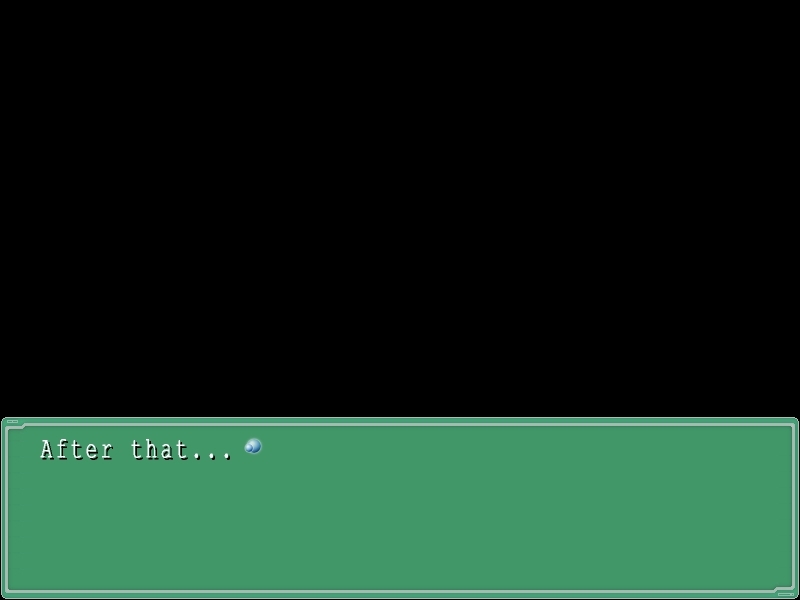 If that is what happened...Then that could've been pretty dangerous..."
Like Tsugumi, I tossed some water on the door. The pipes continued into the Generator Room next door. It seemed that opening and closing the valves could adjust the water and oil pressure. "Normally LeMMIH is responsible for maintaining the Generator Room, but even LeMMIH can't do much when the generator itself goes out. Anyhow, this is all because the power supply is down. This room is designed so that maintenance can be performed manually at times like this, or during blackouts." 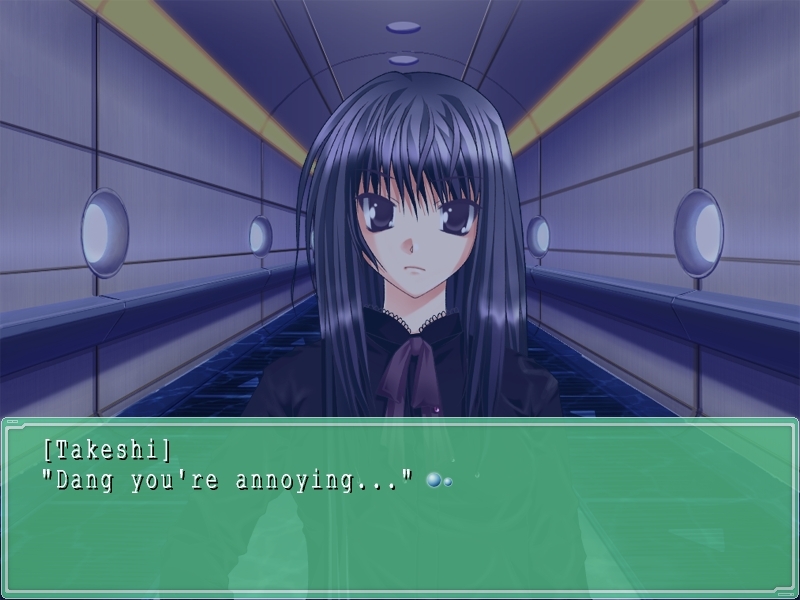 That was what Tsugumi told me. These doubts nagged at my mind. As I was thinking these thoughts, Tsugumi plugged away next to me. 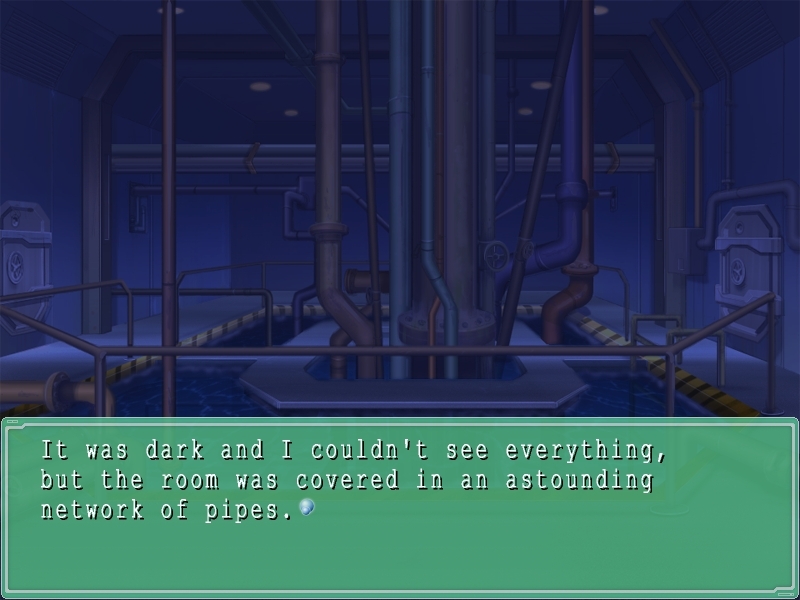 Tsugumi selected one pipe from the countless rows of them and closed its valve. I had no idea which pipe was doing what. "Whew... I think this should do it." As soon as the work was done, Tsugumi left. I was left alone in the room... There were still a number of nagging doubts that I hadn't resolved. Even so, on the other side of the door, it was still hot enough to scald. 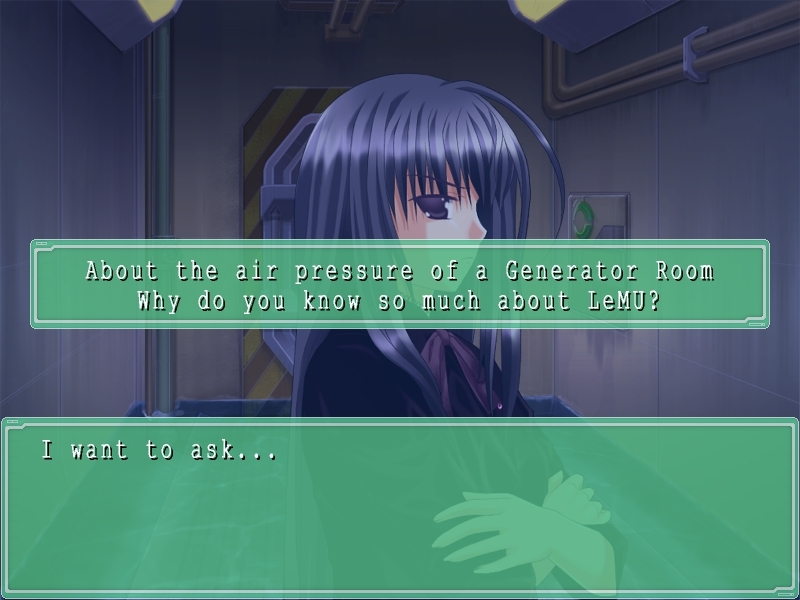 Tsugumi and I waited in front of the Generator Room until the temperature inside had cooled down sufficiently. We sat on the water-covered floor and leaned against the wall. We sat next to each other. We were both already drenched so we didn't have any problem about sitting in water. Besides, the water was warmer than it looked.... I thought it was probably the heat from the Generator Room. "Hey, how long do you think we're gonna have to wait?" Tsugumi didn't even try to answer. It was so dark that I couldn't even tell if she had nodded or shaken her head.In the darkness there were intermittent and repeated clicking noises. It was like the sound of dry plastic crinkling, like on the top of a champagne bottle. 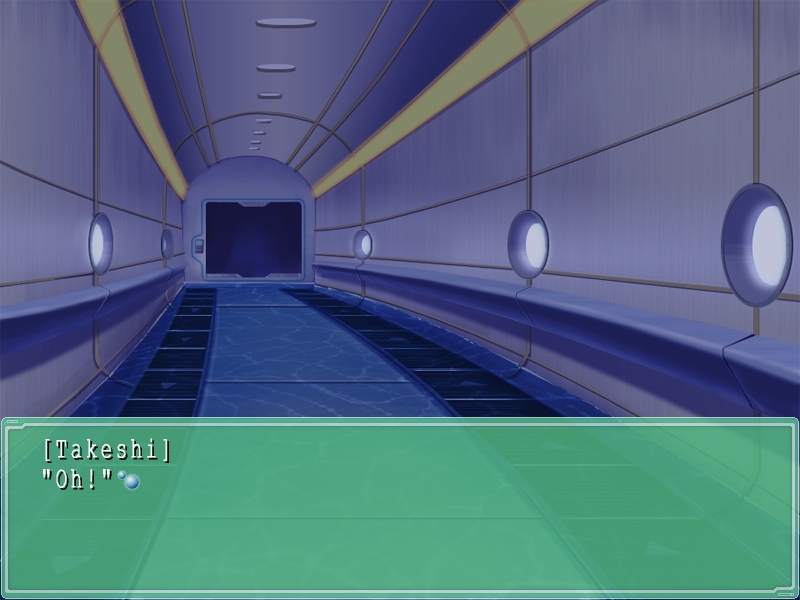 It sounded like it was coming from near Tsugumi's hands. "That crackly sound you're making?" "What is it with you? You only answer when you feel like it?" "I dont have a clue what you're talking about." "My answering has nothing to do with my mood. If a question has meaning, I answer. If it doesn't, I don't...that's all." "So that's the kind of question I don't want to answer. A question to check something... A question about something you don't need to know... Or questions about things that you know I don't know, but you ask anyway..."
"There is more than enough pointless conversation in the world.... Don't you think?" "Alright. I got it already. How about I ask you a meaningful question?"